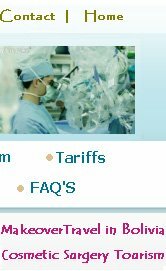 1) What is medical tourism? 4) Why should I work with Makeover Travel? 8) Can I bring along a family member or companion? 13) Why does medical care cost so much less abroad? 14) What services are included in my medical estimate? 15) When are payments due? 16) How do I know that the quality of care is excellent? maintain the same standards of sanitation? to the latest technology and medical devices? 20) How is the nursing care/staff? 23) How many days after the operation can I stay? 26) What is the Joint Commission International? 27) What is JCI Accreditation? Medical tourism is the act of traveling to other countries to obtain medical care. A combination of many factors has lead to the recent increase in popularity of medical tourism: high costs of healthcare in industrialized nations, waiting list, ease and affordability of international travel, improving technology and standards of care in many countries of the world. What should I tell my doctor? Should I inform my local physician that I intend to receive medical care overseas? So we recommend that you inform your treating physician that you are considering receiving medical care abroad. If needed, Makeover Travel will facilitate correspondence between the physician in your home country and the overseas physician that you have selected to perform your medical procedure. I am a small business owner, can Makeover Travel help me develop a medical tourism service offering for my employees? Yes. Makeover Travel provides medical tourism services for both consumers and corporations. We would be happy to help you develop a medical tourism program for your company. With our growing network of providers and high-tech website, it is possible to offer a wide range of medical services to employees for a fraction of the cost. Makeover Travel offers corporate medical tourism services for businesses of any size. Why should I work with Makeover Travel? 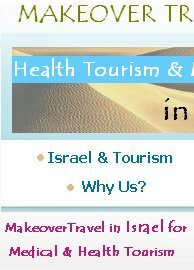 Makeover Travel is the premier medical tourism company in Israel. Makeover Travel will be your expert advisor – a trustworthy consultant with an established relationship with some of the finest medical centers. Makeover Travel is committed to ensuring that our customers have a safe and smooth medical tourism experience from your first call to your return home. Our customer service staff will ensure that this commitment is met. Makeover Travel will provide you with access to affordable high quality medical care. Makeover Travel has carefully selected and screened all of our Network medical centers. Makeover Travel's relationships with our Network medical centers ensure that you receive the lowest cost for your surgical procedure. Makeover Travel’s technology is second to none. Our Medical Information System allows us to rapidly provide you with a number of options for care from different medical centers, doctors and cities. Why has Makeover Travel selected to work with medical centers in Israel? Historically, Israel has had a very strong public healthcare system. Many physicians from all over the world travel to Israel to train. Many of the top physicians that were educated and trained in Israel played an instrumental role in the medical science development in their country. Israel's medical community has had a historical relationship with United States and Europe. Top private medical centers in U.S and Europe are staffed with excellent Israeli physicians. In addition to a vibrant private healthcare sector, the government of Israel actively support the development of medical tourism. From Cabinet level, to the Ministries of Health and Tourism, the government of Israel is developing programs that result in a incredible experience for the medical tourist. How did Makeover Travel select the medical centers in its Network? Makeover Travel selected its Network medical centers based upon a number of criteria. These criteria included a review of their international, domestic, clinical and service credentials; the credentials of the physicians and their history of working with overseas patients. In addition, Makeover Travel's management personally conducted site visits to all of the medical centers that participate in our Network. Some of the main factors that we reviewed on-site were the credentials of the physicians, the use of technology and the modernity of the laboratory and diagnostic equipment. How will I correspond with my physician prior to departure? We will assist you in communicating with you physician. Initial communication is usually in the form of a telephone call with further communication usually taking place by email and/or telephone. Can I bring along a family member or companion? Yes, many medical tourists have a companion accompany them overseas. How long will I need to recuperate before it is safe to fly home? Your recuperation time is dependent upon your medical procedure. You will be advised of your expected recuperation time prior to your departure and your treating physician will advise you when you can safely fly after your surgery. Yes. Your physician will advise you when it is appropriate to take a vacation or recuperate at a tourist destination. 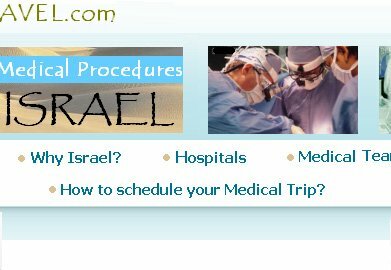 Israel has many beautiful destinations and we would be happy to make your post-surgical travel arrangements. What should I do if I need follow up care when I return home? As stated above, Makeover Travel recommends that you inform your treating physician that you will be receiving medical care abroad. It is important that your physician be aware of your upcoming medical care so that you can receive any needed follow-up care upon your return. How can I reach Makeover Travel when I am abroad? All patients can reach Makeover Travel through our website, email or direct phone line. Additionally, those who elect to use a local guide will have full-time service and assistance from our carefully chosen patient liaisons. Patients can receive expert medical care for 60-70% less cost at our overseas hospital network. Fees in the U.S. are driven by labor overhead, administrative expenses, and insurance contracts. Over 80 percent of hospital costs are labor related according to a recent World Health Organization report which helps to explain some of the cost advantages for countries with low labor costs. Makeover Travel eliminates these burdens by connecting patients directly to hospitals, allowing us to offer premier services at prices unavailable in the U.S. Quality has always been our primary concern at Makeover Travel. Our continued success depends entirely upon our reputation for world-class surgical services. What services are included in my medical estimate? Our medical quotes factor in hospital fees, physician charges, an initial consultation, medical tests as specified, anticipated meal and accommodation charges based on the expected hospital stay, registered nurse coverage and a follow-up consultation after your medical treatment is complete. Each quote will accompany specific terms and conditions for the quote. Separate quotes will be provided for travel-related charges like flight, transfers and accommodation. Login to request a quote from our hospital partners or to use our free cost estimator tool. Prior to the actual medical treatment, consumers are only required to make a small down-payment to schedule their treatment. How do I know that the quality of care is excellent? Our continued success is dependent on our reputation for providing quality care at discounted prices, so the quality of our partner hospitals is our greatest concern. We only work with internationally accredited hospitals that meet or exceed our high standards of care. To ensure exceptional service, Makeover Travel performs a rigorous screening and selection process through on-site visits and extensive research. We also monitor the quality of our providers through patient feedback and reports by international healthcare agencies. What training and background do the physicians at your partner hospitals have? At Makeover Travel, we aim to make healthcare more transparent through information. As our customer, you are invited to review our physician profiles to better understand the qualifications of Makeover Travel medical providers. When patients compare Makeover Travel physicians to doctors in the US or UK, patients find that the qualifications are often superior. In fact, many patients do not realize that each year hundreds of Israeli physicians travel in the US, Europe or Latin America to train physicians or train in foreign medical schools. What are the facilities like? Do the hospitals maintain the same standards of sanitation? The facilities at our partner hospitals are immaculate. Makeover Travel carefully screens our partner hospitals to ensure that they adhere to the highest standards of cleanliness and service. Our patients can expect deluxe rooms, delicious food, internet access, no wait-lists and excellent registered nurse coverage. Our hospitals are internationally accredited like JCI, which ensures that they adhere to the highest standards of sanitation and care. Joint Commission International (JCI) is the international arm of the US-based accreditation body Joint Commission on Accreditation for Healthcare Organizations (JCAHO). In JCI, there are 565 standards divided into 197 core standards that must be met to achieve accreditation and 368 other standards that lead organizations to best practice levels. These standards are further divided into 1033 measurable parameters, which focus on aspects such as patient safety, patient rights, facilities, and physicians` credentials besides policies and procedures of the organization. To get accredited, a hospital will have to fully meet most of these parameters and the remaining ones at least partially. Do Makeover Travel partner hospitals have access to the latest technology and medical devices? Our partner hospitals generally have state-of-the-art facilities and all the latest equipment you would find in Western hospitals. Most of our hospital partners have latest equipments, like the 64-slice CT Scan. Patients can even assess the latest technology for themselves. How is the nursing care/staff? Our Partner hospitals offer excellent registered nurse coverage. Patients often find that the ratio of nurses to patients is significantly better than that of Western medical centers. Will I experience language difficulties or translation problems? Your physicians and nurses speak fluent English, Russian, Hebrew, French, Arabic, Spanish so patient should have no trouble communicating with nurses and physicians at our partner hospitals. All patients can reach Makeover Travel through our website, email or direct phone line. Additionally, Makeover Travel offers local guide in selected cities to help you in any translation and logistic services. How many days prior to the operation do I have to leave? It depends on the medical procedure. At the time of quote, our hospital providers will advice on how many days prior to the treatment you need to be there. Typically, it is just a day. How many days after the operation can I stay? We adhere to the strictest standards of patient privacy. All of our forms and processes are secured. All your personal data that you enter or access in our website is SSL encrypted and requires user name and password to access. Makeover Travel will not share your personal information with anyone without your authorization. Refer our privacy statement for further information. What is hospital accreditation and what are the benefits? Accreditation is a process in which an entity, separate and distinct from the health care organization, usually non-governmental organization, assesses a health care organization to determine if it meets a set of standards requirements designed to improve quality of care. Accreditation is usually voluntary. Accreditation standards are usually regarded as optimal and achievable. Accreditation provides a visible commitment by an organization to improve the quality of patient care, to ensure a safe environment and to continually work to reduce risks to patients and staff. Accreditation has gained worldwide attention as an effective quality evaluation and management tool. What is the Joint Commission International? This is a United States based hospital accreditation organization that makes sure accredited hospitals have state-of-the-art health care facilities and technology along with advanced transportation and communication systems. JCI accredited hospitals' health care standards, professionalism and quality of their doctors are equivalent if not superior to those you find in the United States of America. Joint Commission International (JCI) extends the Joint Commission`s (JCAHO) mission worldwide. Through international consultation, accreditation, publications and education, Joint Commission International helps to improve the quality of patient care in many nations. Joint Commission International has extensive international experience working with public and private health care organizations and local governments in more than 60 countries. In response to growing interest in accreditation and quality improvement worldwide, the Joint Commission launched its international accreditation program in 1999. Joint Commission International accreditation standards are based on international consensus standards and set uniform, achievable expectations for structures, processes and outcomes for hospitals. Joint Commission International`s standards for hospitals clearly define the principals and processes needed to assess the key functions of acute care organizations and associated ambulatory settings. How does JCI ensure the quality of hospitals in its network? Assess the quality of patient care from the time a patient enters a facility to discharge. Utilize this data to plan and implement changes that create optimal care. Bring efficiency and best practices to all phases of management, from clarity of leadership’s responsibility and accountability to critical facility managed processes and board strategic planning. Measure performance against both the core requirements needed to achieve accreditation and additional standards that lead organizations to best practice levels. Implement standards that focus on patient safety and risk reduction in clinical processes.